Thread: Hello - Work In Progress - Please Be Gentle! Very nice, there is an air of mystery about this painting. I like it - the female form has movement. Looking forward to more. That's my kind of Road trip! It looks like a sachet. Indeed you do have some nice movement in her body position. Feels active. And of course thematically, it certainly begs the question and invites the viewer to participate in an explanation, and that's a wonderful device for picture making. In a way, this reminds me of a painting done by Andrew Wyeth. 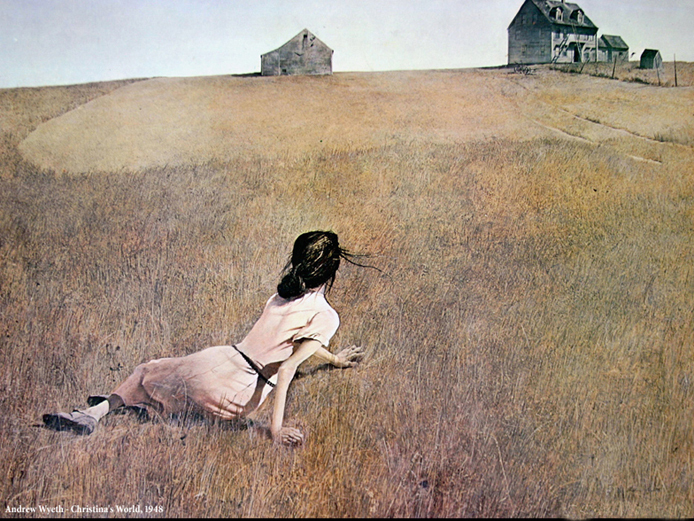 He painted Christina's World, a scene that intrigued me when I was first learning painting and first discovered Andrew Wyeth, but it was not until years later that I discovered the story behind this – – being that she was crippled, this having a rather profound payoff to the mystery that was created by the evocative image and why he staged it as he did with her in the sea of virtually nothing with everything being so far away from her, emphasizing her perpetual difficulty getting here to there. She also had on a dress in a place where it seemed to me somewhat incongruous being that it was more of a house dress and she was out in the middle of the field. The unexpected quality makes for a compelling image, and I believe that you got that happening in your painting. Last edited by D Akey; 03-30-2015 at 05:00 AM. very nice work. I see quite a talent in the variety and use of mark making to organize this , plus it is an intriguing image. very well done and welcome Big G !. Thank you all very much. A very kind introduction to the forum. Welcome! Don't worry for Your start, it's hard to be fully satisfied even after many paintings and, unless You're a professional, so You can hardly expect to get a masterpiece at Your first try and without some practice with the tools at least. This paintings has several good points and interesting hints to work on furtherly. Nice work. I like the movement and loose lines. Do you do storyboard art?